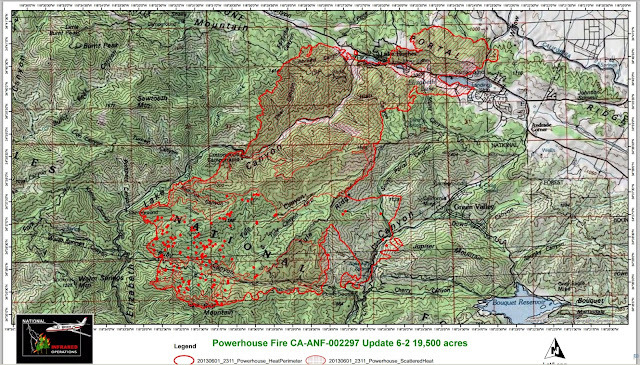 Evacuation order is in place for large portions of fire area. 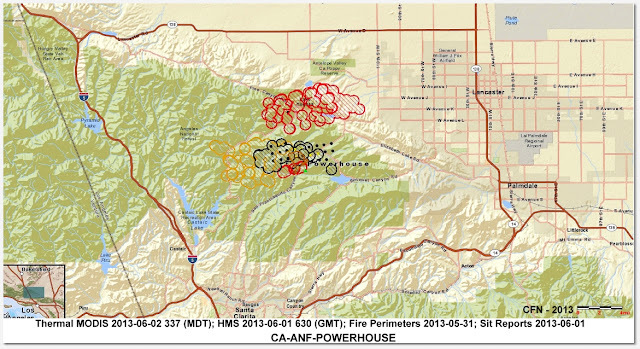 Update 6-3-13 0800: Powerhouse Fire CA-ANF-002297, North West of Green Valley Los Angeles Co. Fire is in Unified Command: Angeles National Forest, SoCal T/2 IMT#1 (Walker), Los Angeles County Fire (Tripp), CALFIRE (Veneris). California IMT#5 (Joseph) is being mobilized and will assume command June 3rd, 1800 hours tonight. 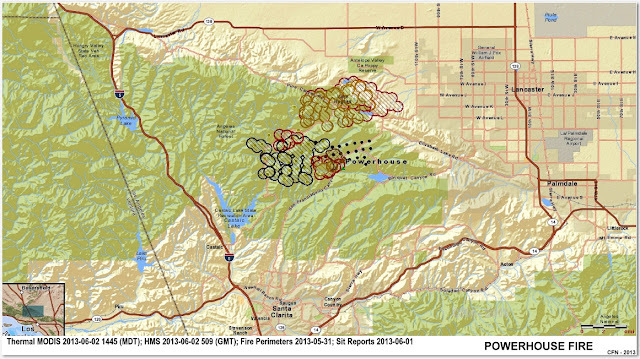 Fire activity somewhat moderate overnight with increased humidity. Fire Behavior Rapid rates of spread with a high resistance to control efforts. Fire Exhibited moderate to long range spotting in receptive fuels and winds from the NE. Burned actively throughout the night with poor humidity recovery. Fire was able to come into alignment with slope, winds, low RH and critically dry fuels making extreme head runs on all open divisions with long range spotting and very active backing and flanking fire. Fire exhibited extreme rates of spread and became established across the aqueduct and Lancaster road. Evacuations: The rapid and unpredictable fire has made evacuations difficult. Hikers on the PCT are being rerouted to the desert. The communities of Lake Hughes is under mandatory evacuations and Elisabeth Lake is under a voluntary evacuation order from the Sheriffs. 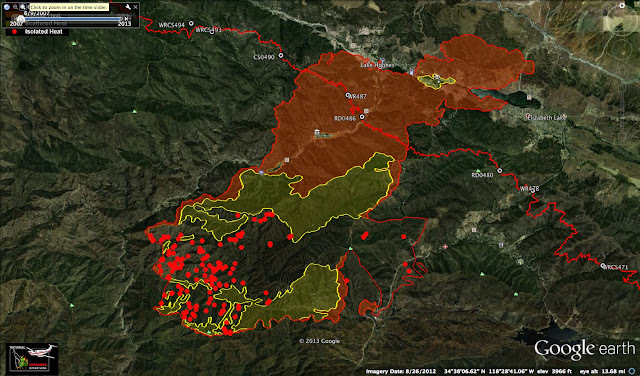 1000 + structures threatened. Evacuations remain in place along Lake Hughes Road including two youth probation camps and Cottonwood campground. Kerr Park, 39700 30th St. W. Palmdale, 93551 for residents. Red Cross will identify any new animal evacuation centers. Small animals Lancaster Animal Shelter, 5210 W Avenue I, Lancaster, CA 93536 or Castaic Animal Shelter, 31044, Charlie Canyon Rd, Castaic, CA 913536. More Information: Check with Palmdale Sheriffs Dept. for more detailed information regarding any evacuations at (661) 272-2400. Concerns Power lines and the communities of Green Valley, Lake Hughes, Elizabeth Lake. Critical watershed and T&E species continued to be impacted. Road Closures: Lake Hughes Road has been closed from Cottonwood campground on the North to Lake Castaic on the South. San Fransciquito Canyon Road remains under a hard closure. Bouquet Canyon Road is under a soft closure open to residence only. Elisabeth Lake Road is under a soft closure open to residence only. This wildfire is burning in steep rugged terrain. 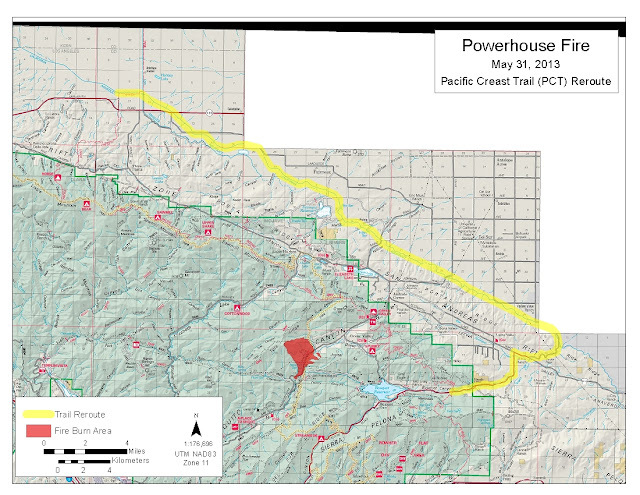 Powerlines are located within the vicinity. 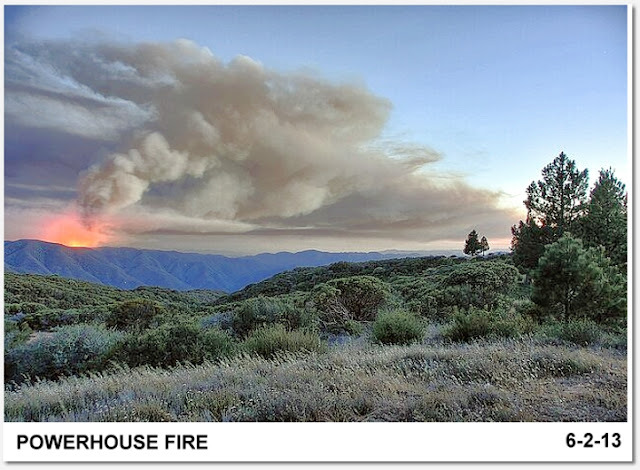 Update 6-2-13 2000 OSCC: Powerhouse Fire CA-ANF-002297, North West of Green Valley Los Angeles Co. Fire is in Unified Command: Angeles National Forest, SoCal T/2 IMT#1 (Walker), Los Angeles County Fire (Tripp), CALFIRE (Veneris). California IMT#5 (Joseph) is being mobilized and will assume command June 3rd, 0600 hours. COMMS: "ALL HANDS ON STRUCTURE BRANCH PROTECTION YOU DID GREAT WORK LAST NIGHT & TODAY IT WAS APPRECIATED"
Update 6-2-13 1500: 25,000 acres, 20% contained, 2100 firefighters, 6 houses burned, structure protection ongoing, 20-25 MPH winds 9 Air Tankers working including 1 VLAT 10 copters, Active fire pushing northeast aligned with wind/topo, Fire is heading to Grass Mountain Fairmont area. Update 6-2-13 Noon: Press Conference is scheduled today at 4pm at the Incident Command Post at Pelona Vista Park in Palmdale. ALERT: Civilian traffic is hampering the response of emergency vehicles entering and leaving the lake communities. Please avoid Lake Elizabeth Rd and surrounding roads. Expect heavy emergency vehicle traffic in the those areas. 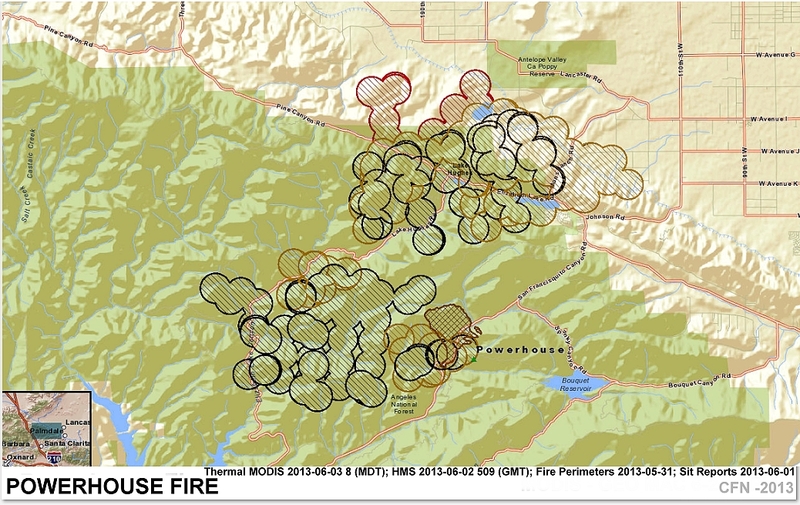 Avoid the areas if possible so emergency crews and have easier access into the fire areas. CHP & LASD are now enforcing a hard closure on Lake Elizabeth at Bouquet Canyon Rd. Incident Command Post is at Pelona Vista Park on Tierra Subida Ave in Palmdale. Staging area is at Highland High School on 25th St W. Evacuation Center is at Marie Kerr Park, 39700 30th St. W..
Acton, CA – The Powerhouse fire grew to more than 19,000 acres late yesterday evening. Despite efforts by firefighters, fifteen structures were damaged. Five of those fifteen structures were destroyed. The communities of Lake Hughes and Elizabeth Lake were evacuated and firefighters continued to battle the blaze through the night concentrating on defending as many structures as possible in these and other areas. Over 1,000 structures remain threatened today. Three night flying helicopters joined the battle and a Forest Service Air Attack. Air Attacks are in small air planes that fly above the helicopters and direct them where to attack the fire. Two of the night flying helicopters were from the Los Angles County Fire Department and the third was from the Los Angeles City Fire Department. Earlier in the day, a Forest Service contract VLAT (Very Large Air Tanker-DC-10) joined the fight and tried to stop the fire along a ridge just south of the communities of Elizabeth Lake and Lake Hughes. The fire conditions turned extreme yesterday afternoon as high temperatures, hot winds, very dry fuels and atmospheric instability all combined to allow the fire to move rapidly through steep and inaccessible canyons where firefighters could not safety construct fire line. 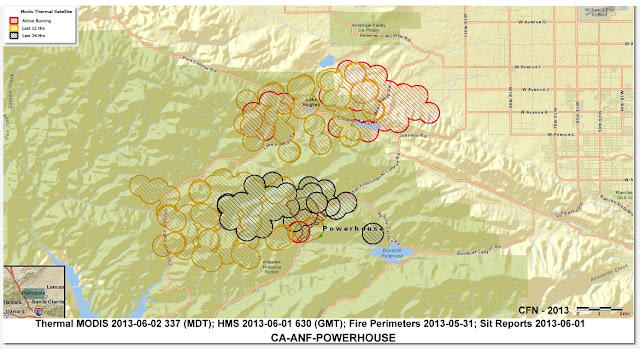 Damage assessment teams will be working in the Lake Hughes and Elizabeth Lake communities to gather information about the fire impacts in these area. Cross shelter has been set up at Marie Kerr Park in Palmdale: 626-536-1152, 661-433-9710. • PCT is closed in the fire area. Please check PCTA.org or inciweb.org for updates. • Lake Hughes road has been closed from Elizabeth Lake road to Lake Castaic. • San Francisquito Canyon road is closed above the Power House and below Green Valley. is closed in the fire area. Powerhouse Fire Jumps to 19,500 Acres, Burns 5 Structures; 3 Firefighters Injured when Fire was able to come into alignment with slope, winds, low RH and critically dry fuels making extreme head runs on all open divisions with long range spotting and very active backing and flanking fire. Fire spotted and became well developed north of Lake Hughes Road. 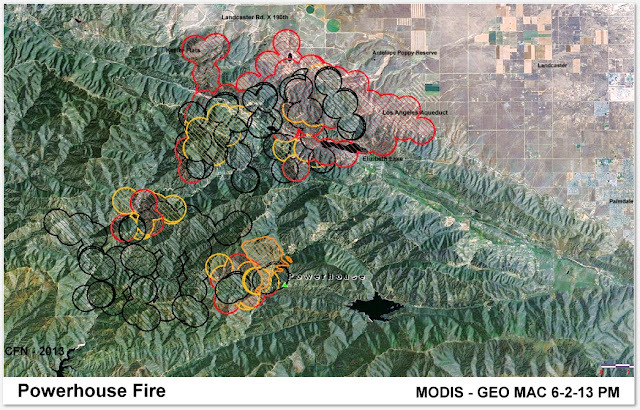 EVACUATIONS: Evacuation orders were expected to remain in effect at least through Saturday night for the following areas: the Forest Service's Cottonwood Campground, L.A. County's Camp Mendenhall juvenile detention center and areas along Lake Hughes Road, Judy said. 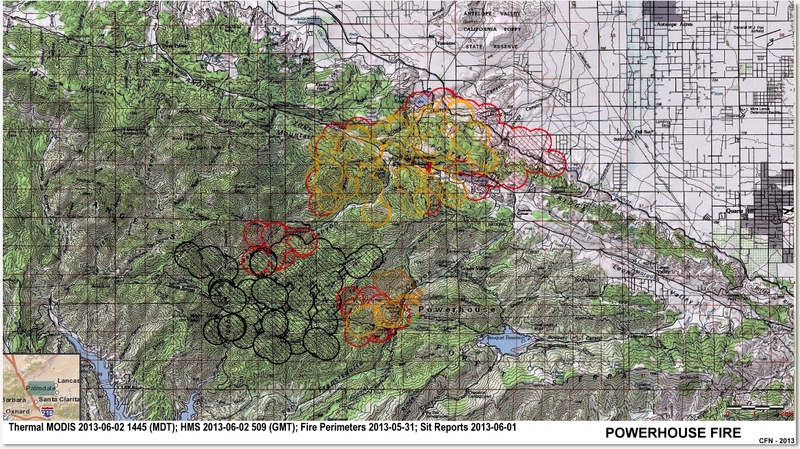 Other evacuations remained for areas north of South Portal Road and west of San Francisquito Canyon Road. A Red Cross evacuation center was set up at the Marie Kerr Park's recreation center at 2723-A Rancho Vista Boulevard in Palmdale. An evacuation center for large animals has been set up at the Antelope Valley Fairgrounds at 2551 West Avenue H in Lancaster. businesses, commercial property and out buildings. Fire North of Elizabeth Lake in the area of Myrick Canyon could jump the Aqueduct. Critical watershed and T&E species continued to be impacted. Hikers on the PCT are being rerouted into the desert. through developed sites caused damage. and Elizabeth lake. SRA lands North of Elizabeth Lake are threatened. with the continued use of the VLAT and other aerial assets. and security for the fire area. Fire was able to come intoalignment with slope, winds, low RH and critically dry fuels making extreme head runs on all open divisions with long range spotting and very active backing and flanking fire. Fire spotted and became well developed north of Lake Hughes Road. Rapid rates of spread with a high resistance to control efforts. Fire Exhibited moderate to long range spotting in receptive fuels and winds from the NE. Burned actively throughout the night with poor humidity recovery. Fire was able to come into alignment with slope, winds, low RH and critically dry fuels making extreme head runs on all open divisions with long range spotting and very active backing and flanking fire. Fire spotted and became well developed north of Lake Hughes Road. The communities of Lake Hughes is under mandatory evacuations and Elisabeth Lake is under a voluntary evacuation order from the Sheriffs. 1000 + homes threatened. Lake Hughes Road has been closed from Cottonwood campground on the North to Lake Castaic on the South. Check with Palmdale Sheriffs Dept. for more detaled information regarding any evacuations at (661) 272-2400. San Fransciquito Canyon Road remains under a hard closure. Bouquet Canyon Road is under a soft closure open to residence only. Elisabeth Lake Road is under a soft closure open to residence only. Kerr Park, 39700 30th St. W. Palmdale, 93551 for residence. Red Cross will identify any new animal evacuation centers. Small animals Lancaster Animal Shelter, 5210 W Avenue I, Lancaster, CA 93536 or Castaic Animal Shelter, 31044, Charlie Canyon Rd, Castaic, CA 913536. A Type 2 Incident Management Team is currently managing the Fire. *Estimated Containment is June 5, 2013. This wildfire is burning in steep rugged terrain. Powerlines are located within the vicinity.